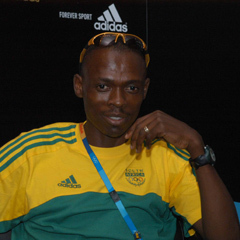 Cape Town - Team SA manager Hezekiel Sepeng says it's likely that the 4x400m relay team will appeal after they crashed out of their heat at the 2012 London Olympics on Thursday. Ofentse Mogwane fell on the final bend of the second leg when he made contact with Kenyan Vincent Killu and both came to grief. The Olympic Team SA 2012 twitter page confirmed the news, when they tweeted: We may be able to appeal for re-submission into the MEN'S RELAY! Due to video proof that the Kenyan runner tripped us!